The combination of ground beef and pork is the secret behind these juicy burgers. The never-fail burgers are ideal for summer grilling, so I depend on them time and again. Everyone loves them. Plus, you can easily double or triple the recipe for large get-togethers. Dovetailing Tip: Save the bacon drippings to use in the Grilled Potatoes & Onions in today's meal. In a small skillet, cook bacon, onion and garlic over medium heat until the bacon is crisp; drain and place in a small bowl. Stir in the bread crumbs, egg, water, parsley, salt, marjoram, paprika and pepper. Crumble beef and pork over the mixture and mix well. Shape into eight 3/4-in.-thick patties. Grill, uncovered, over medium-hot heat for 4-5 minutes on each side or until a thermometer reads 160°. 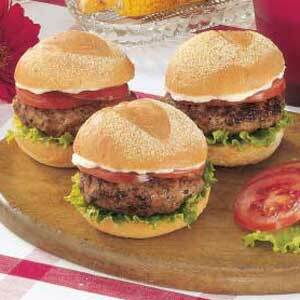 Serve on buns with mayonnaise, lettuce and tomato. Yield: 8 servings.